Calling this album mainstream is a bit misleading, since it includes four pieces of choral/sacred music and one avant-garde cut. 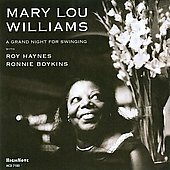 In a way, it's the perfect mirror of where Mary Lou Williams was in the early 1960's, coming out of a nearly ten year absence from performance. At the beginning of that period she had devoted herself solely to religion and charitable work. Jazz-loving priests within the Catholic church convinced her to convey her religious feelings through what she did best: performing, composing, and arranging. Here we have some of the beautiful results. The hymn "St. Martin de Porres" celebrates the life of a recently-canonized Peruvian patron saint of interracial justice, complete with modern jazz harmonies and rhythm patterns, ascending and descending chromatics and falls, with a brief, simple Latin piano interlude. 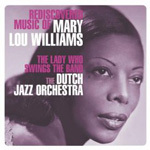 The very hip jazz waltz "Anima Christi" has the usual strong bass line of a Mary Lou Williams tune, here doubled by Budd Johnson on bass clarinet. Vocal soloist Jimmy Mitchell reminds me of a higher-pitched Lou Rawls. Grant Green's clean, hip, tasty blues licks flavor the piece throughout. "Praise the Lord" brings together inspired gospel and the feeling of a great jam session, with swing era vet Budd Johnson wailing on tenor sax. Jimmy Mitchell quietly raps. By the time he sings "Everybody clap your hands now," you'll be doing that or moving your body in some fashion. Exploration was the hallmark of Mary Lou's career. Here she takes the journey into rhythms and deeply into the blues. At times her playing is very spare but deeply felt. 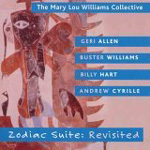 "A Fungus A Mungus" takes the listener in a polytonal direction, hinting at her later interest in Cecil Taylor. The only weak points in this album are Tim Kennedy's bongo work on "A Grand Night for Swinging" and the mediocre sound quality of Percy Heath's fine solo bass on "Forty-Five Degree Angle."